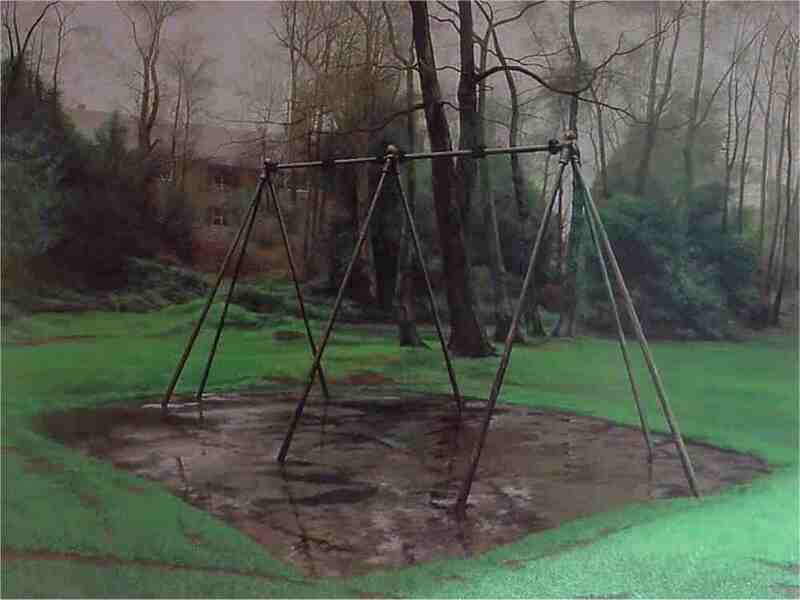 The landscapes in George Shaw’s paintings all conceal stories but in this case the narratives are Shaw’s own childhood memories. For the series Scenes from the Passion, Shaw worked from photographs taken within a half mile radius of the house he grew up in. The area is unremarkable and, in Shaw’s paintings, unpopulated. There is a bleakness here but also perhaps a sense of anticipation. Though the area is very specifically the territory of Shaw’s childhood in a way it feels like the paintings depict a kind of everytown. There are certainly scenes here that I can match against my own suburban London upbringing. 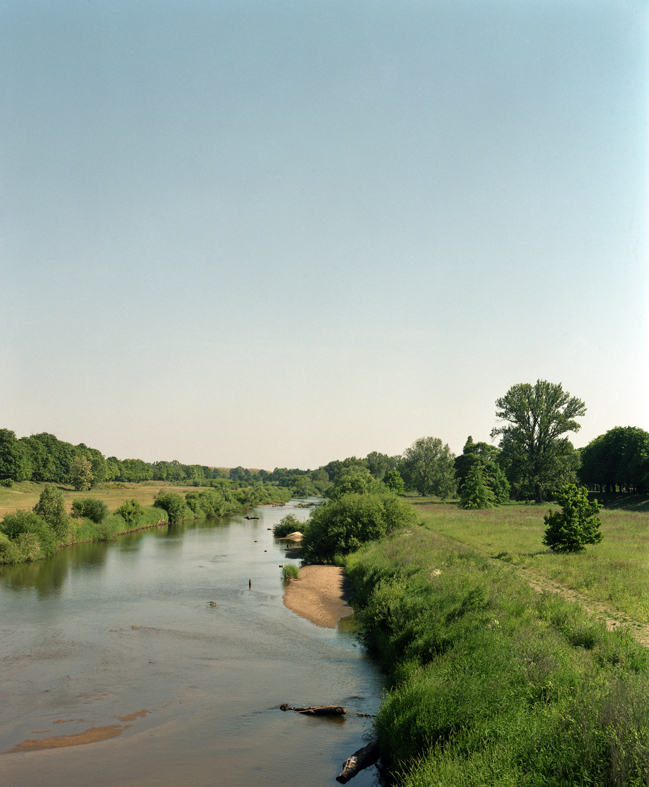 The pictures in Mats Bergsmeden’s series Border Line are very beautiful landscape photographs. Most seem like idyllic places, indeed my immediate thought was of the pastoral idyll of landscape painting and this seems to be Bergsmeden’s intention, with the specific reference of the landscape tradition in European painting during the Age of Enlightenment. Some of the pictures are of places where man’s intervention is limited to controlling nature but in some there are signs of the built environment and industry. Though all the images are unpopulated, in some we seem to be approaching signs of human activity; there is a sense that we are on the outside looking in. It would be possible to appreciate these as beautiful landscape photographs without reading anything more into them, but that would be to completely miss the point. At first sight, Simon Starling’s Shedboatshed (Mobile Architecture no. 2) appears to be a readymade. It’s an old shed. It looks a bit the worse for wear, but age will do that to a shed. Things aren’t quite a simple as they appear though and the first clue’s in the title. Shedboatshed is a shed. Shedboatshed started out as a shed. But it hasn’t always been a shed. Starling turned an old shed, which he’d found in the banks of the Rhine, into a boat which he then used to get to Basel, carrying the unused parts of the shed in the boat. 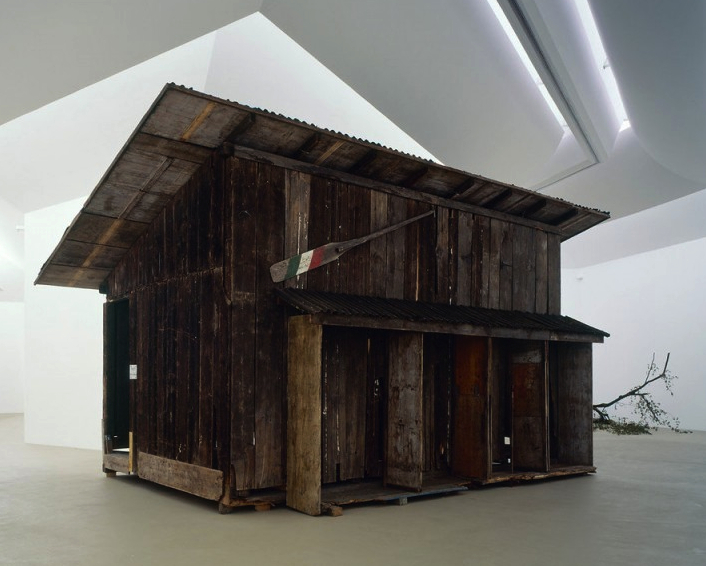 On arrival, the shed was reassembled and exhibited in the Kunstmuseum Basel and later that year in Tate Britain as part of the Turner Prize exhibition, which Starling won. 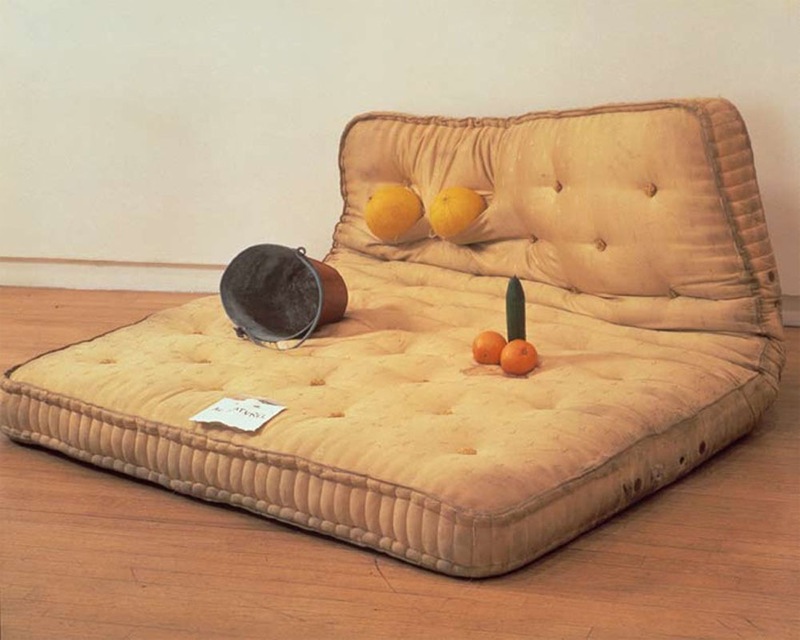 Having seen quite a bit of work made from existing objects recently and having been reminded about Au Naturel by seeing Tracey Emin’s Dead Sea in her exhibition at Turner Contemporary, which I wrote about here a while ago, I find myself wondering why it’s taken me this long to write about Sarah Lucas’s work. Essentially, Au Naturel is a very simple sculpture of a man and woman in bed, he represented by two oranges and a cucumber, she by a bucket and a pair of melons. What makes this work for me is that the visual joke of the assemblage triggers thoughts about language and the slang terms used for body parts. In particular, with works like this, Lucas draws attention to the derogatory way women’s bodies are often described colloquially. After I came back from a trip to New York with students in the spring I wrote a lot here about the art I saw in galleries there. One thing that I didn’t write about at the time was a small painting I saw at the Metropolitan Museum; the relevant page on the Met’s website has been open in a browser tab on my laptop ever since I think, but it was seeing Mel Brimfield’s Clement Greenberg – Lee Krasner = Jackson Pollock that brought Lee Krasner’s painting back to mind. 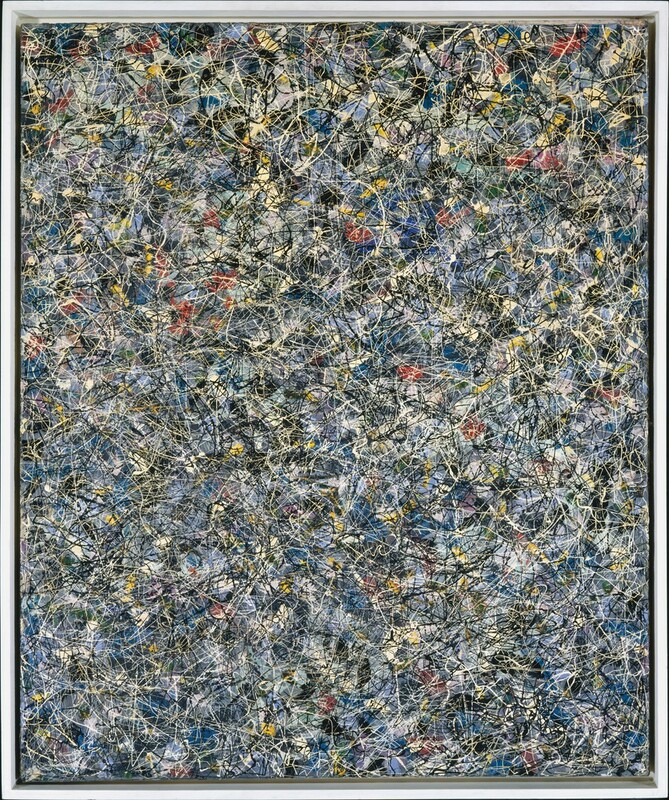 Though Krasner’s career was played out in the shadow of that of her husband Jackson Pollock, her contribution to twentieth century American modernism, and to abstract expressionist painting in particular, was considerable. Unlike Pollock’s action paintings, this work is modest in scale 76.2 x 63.5 cm to Autumn Rhythm‘s 266.7 x 525.8cm and the painting seems to me to be much more about the outcome than the performance of making it. Mel Brimfield makes art about art in a very different way to others that I’ve written about here before (the reworkings of Hogarth’s A Rake’s Progress by David Hockney and Yinka Shonibare or Gregory Crewdson’s remained Edward Hopper picture, for instance). 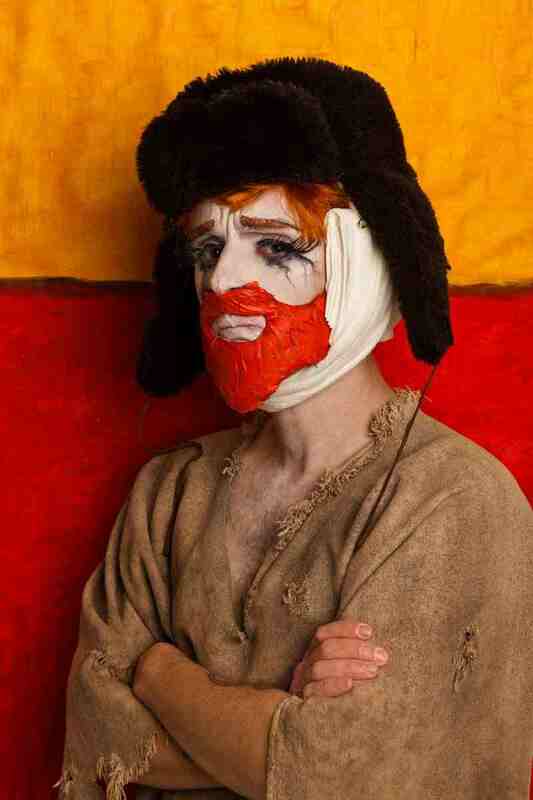 As with Shonibare’s Diary of a Victorian Dandy, Brimfield’s work is performative but there’s a humour in the work that feels more connected to Nina Katchadourian’s Self-portrait as Sir Ernest Shackleton though in Brimfield’s work the performances are collaborations between artist and performer. The resulting works – photographs, videos and sculpture – reference not only the artists Brimfield is looking at but also our ideas about art and the way the artists have been represented in films. Brimfield’s exhibition Between Genius and Desire at Ceri Hand Gallery Project Space – the gallery’s first show in London – gave me a lot to both think and smile about. There’s something different about London this summer. The Olympic feelgood factor coupled with a bit of actual sunshine after the seemingly interminable rain means we seem to have found ourselves in a mood to both celebrate our country and the odder aspects of its history and traditions and to jump about. On hand to help out – as part of the London 2012 Festival, the culmination of the Cultural Olympiad – is Jeremy Deller’s Sacrilege. 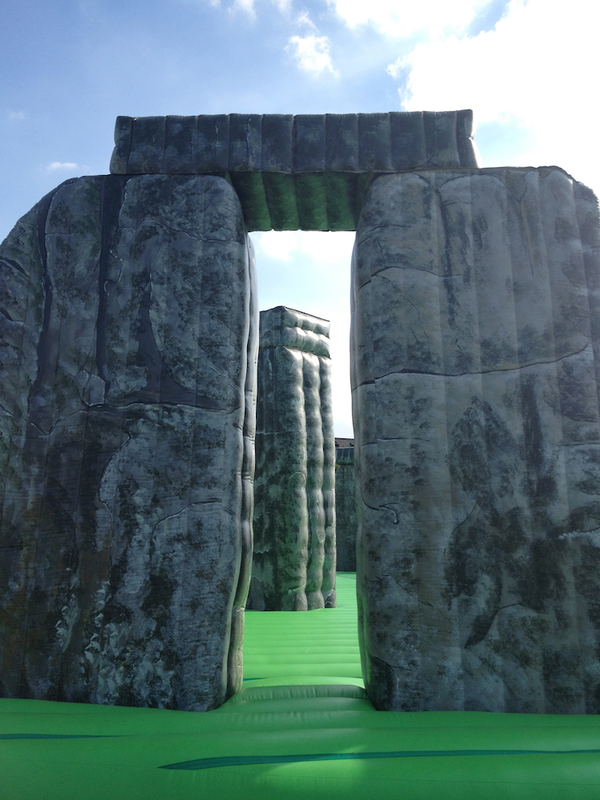 As playful reworkings of our heritage go, a life-size bouncy castle version of Stonehenge certainly hits the spot (especially as it comes complete with anxious announcements about health and safety).